City Royal Hotel which is well known for its traditional Khmer hospitality, located in the road side. This is situated between the airport and the city center so from here all the attractive places in the city are very near and reachable within some minutes. The hotel has many facilities and this is re-fabricated recently for the guests comfort. This is a 100 room hotel with all the facilities like air conditioning, satellite TV, hair dryer, direct telephone line, bathrooms with shower, mini bar, tea and coffee making facilities, iron and ironing board, double beds with balcony. Also, balconies have the view which mesmerizes everyone as it is surrounded by mountains and seas. 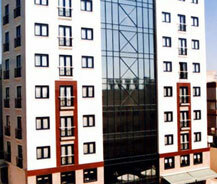 In these 100 rooms of City Royal Hotel, there are three categories such as twin, triple and suites. All these rooms are designed with international style with architectural touch. The rooms are decorated in a more stylish way with warm lightings, white walls, and brightly colored textiles. The rooms are very calm and thus provide ultimate privacy so that you can enjoy a great trip of holiday at City Royal Hotel. The hotel also incorporates a Turkish in-door swimming pool, casino and massage center. This is available all around the year and guests can make use of it at any time.